Today I’m proud to introduce the lovely Ciara, who runs Kimi Magazine. Besides being one of the best magazines in the world, Kimi Magazine is a magazine that’s different from your average magazine- all its profit goes to an organization called ‘Eating Disorders Victoria’ in Australia. Kimi promotes new talent(artists, models, musicians etc), a healthy lifestyle, and healthy standards. Ciara has done incredible work for Kimi Magazine, and has helped and inspired people to love themselves for their own individuality. She’s my newest role model and I can guarantee that you guys will also look up to her after reading this interview. So bring your friend, sister, brother, parents, or whoever else you think needs some inspiration and warmth right now, and without further ado, let’s begin! K: Hi Ciara! First of all, introduce us to Kimi Magazine! C: Hello Konni, lovely to meet you! 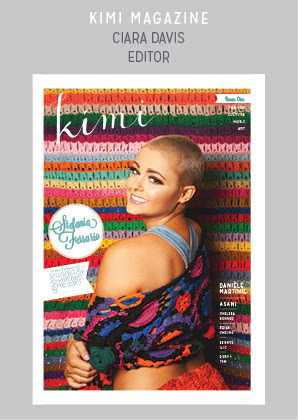 Kimi Magazine is a fashion, culture, music and art magazine that aims to evoke positivity and warmth in its readers. All our pages are colourful and bright, all our stories are optimistic yet realistic, and intend to lift your mood. And most importantly, all our models are healthy in mind and body. We sell copies for $15 each, and 100% of the proceeds earned are injected into the budget of the amazing team at Eating Disorders Victoria. Every donation counts! K: Why did you start Kimi Magazine? What got you inspired to make Kimi? C: I had the idea for a couple of years before I began the project, because it was only last year when I first realized that I’d saved enough funds to get it started! One of my closest friends has been in and out of psychiatric wards suffering from an eating disorder since we were 9. The wards have white walls with little colour, and to my horror, most of the girls were reading mainstream fashion magazines and watching Next Top Model! I understand that many people like these shows/zines, but they aren’t going to help these sick patients recover. So I went to buy my best friend a fashion magazine that used realistic, non-photoshopped models and had stories that didn’t mention ‘calories’ or ‘bikini bodies’ … and noticed that there were none. Why? I thought. Why can’t there be a fashion magazine using a range of models? Why can’t there be a fashion magazine with only minimal and necessary editing? Why can’t there be a fashion magazine that has recipes that aren’t focused on weight loss? Why can’t there be a fashion magazine that you can read, start to finish, without feeling like you’re not good enough? Something had to be done… and from that day onward, I had decided that no matter how much effort, cost, tears or stress it would require, I would do it myself. (Model: Stefania Ferrario. Photographer: Georgia Wiggs. Make-up: Pip Davies. Stylist: April Montgomery. Kimi Magazine. K: What are your prospects for the future of Kimi? This, and masses of other evidence, is irrefutable – our media is greatly influencing our ideas of beauty in a negative manner, and it is about time somebody took a stand. Cue Kimi – a project that I’ve been hoping can act as a light at the end of the dark tunnel we’ve been trapped in for so long. I want Kimi to grow in sales, not only for the charity’s sake, but so our message can reach a wider audience. Owning a piece of untainted media could have a huge impact with some expansion… Hopefully, this will give us more of a shot at opposing the intentionally confidence-crushing magazines that have flooded our mainstream media. K: Now tell us about YOU, Ciara! How old are you, what are you studying/what did you study, where did you grow up..? C: I am 21 years old, from Melbourne in Australia (it’s true – the weather is crazy, four seasons in one day!). I am currently studying my third year of a Bachelor of Youth Work at Victoria University. Whilst I was fortunate enough to grow up in the middle class and attend a private school, I never associated with the materialistic attitudes adopted by many of the people around me. Though I was in a wealthy household, my dad in particular ensured that my sister and I earned our own money from a very young age. I started waitressing at his restaurant when I was 13, and am very grateful for the work ethic that has been ingrained in me. My mum has also been very influential – she is currently nursing for an Indigenous community, which involves leaving the city to live in isolation for weeks at a time. Her generosity and selflessness has undoubtedly had a very formative impact on me. K: What’s the most important thing to keep in mind when picking an outfit to wear? C: “Does the outfit reflect YOU?” – definitely the most important thing to keep in mind! Wearing an outfit that is not “you” is, in my opinion, very easy to see, as the person in question will not look 100% comfortable. Whilst I hire stylists for my photoshoots, I will ensure that they choose clothing that reflects who the model is, and NEVER have them dressed in anything outside of their comfort zone… Hence the importance of meeting all my models before hiring them. I can get a vibe for who they are and take note of their individual style. But most importantly, it helps me guarantee that they’re a lovely human being who I will be proud to feature in this project. These are the models that really glow in any outfit, and this is illustrated in the editorials! K: Why is fashion important? C: Fashion is, or should be, who we are inside expressed outwardly… allowing us to embrace what makes us unique, to show the world a little something about ourselves. My best friend and I have similar style – we love clashes in textures and layers… we love beads and sequins… we love daggy, patterned jumpers that are three sizes too big… we love secondhand and pre-loved pieces… we love jewelry (that we generally make for each other!). We are both very imaginative and creative people, who feel nostalgia for our childhood days of stick-on earrings, friendship bracelets and overalls… When fairy dresses weren’t a “costume”, but a perfectly acceptable item of clothing we could (and would!) wear five times a week. K: What do you think teenage girls these days need the most? What piece of advice do you have for us? C: Teenagers are under so much stress on a daily basis. Parents, teachers, fellow peers and the media are just some of the many sources of pressure and standards. They dictate how we’re meant to look, what we’re meant to desire, who we’re meant to be… It can really take away our sense of individuality. K: You featured some musicians in Kimi… I’m just curious, what kind of music are you into? C: Whilst growing up, my mum and dad were kind enough to introduce me to a range of music that I still love to this day! My favourites would have to be Bjork and Jeff Buckley, probably because I not only fell in love with their music, but also deeply respect who they are and what they stand for. I also adore David Sylvian, who I think is one of the most underrated musicians of all time! K: What did you want to be when you were a little girl? K: What do you think of Konni Kim Designs? C: Fashion is in the eye of the beholder, so I have no idea how to answer this! To those who like eccentric, eclectic fashion then yes, I suppose so. But my style wouldn’t be ideal for those who opt for the chic and sleek, like my sister (studying her Masters of Architecture) – she gravitates towards structured clothing in shades of mainly blacks or greys, and looks really elegant and classy in everything she wears. My style would not suit her, just as her style would not suit me, as our outfits reflect who we are (polar opposites!). It’s all a question of preference. K: What’s your average day like? Are you very organized and busy, or do you tend to lounge around and get inspiration from random things? C: I am very busy all the time, and I couldn’t have it any other way! Last year I decided to join my certificate and diploma degree together to save myself a year of study; this meant I was at university Tuesday nights, Wednesdays, Thursdays, Friday mornings and every 3rd Saturday – on top of that, I had to fit in 250 volunteer hours to complete my course. Fridays and Saturdays when most people are going out, I would be working til early morning, as that’s the only hours I could fit in a job… And the little spare time that remained after that hectic schedule, I spent on the Kimi project! But this lifestyle is my choice – I love positively contributing to society. The rare day when I don’t do anything productive, I really don’t feel like myself! (Photographer: Georgia Wiggs. Food stylist: Christabell McDonald. Model: Oats the Rabbit! Kimi Magazine. K: Are you an artist? C: I am a musician, if that counts! I used to study the Bachelor of Music at Victorian College of the Arts, and also started a diploma of jazz piano at Ballarat University. Whilst I love and miss studying music, I am much happier continuing it as a hobby, as pursuing youth work is my true calling. K: What is one item in your wardrobe that you just NEED to have and can’t ever throw away? C: Since I am a sentimental person, it would have to be the sparkly blue scarf that my best friend knitted me for my 21st birthday whilst she was in hospital… I used it for a feature in issue one, you can spot the musician Asami wearing the beautiful scarf in some of the shots! K: What were you like when you were seventeen? C: At 17, I was very scattered in terms of my goals and dreams. I knew I wanted to end up in a career that would be humanitarian, but had NO idea what to specialize in! Whilst I had known Amelia since birth (our mothers were friends before we were born), she moved away to Albury, and it wasn’t til 4 years ago that we became close again. It was during this time, witnessing her struggles and her strength firsthand, that I decided I wanted to contribute to the field of Eating Disorders. Visiting various wards on a daily or weekly basis opened my eyes to a myriad of deficiencies in the system; these realizations crystallized into certainty of what wrongs I wanted to right in this world. She is constantly my inspiration, whether we’re seeing each other every day or whether we haven’t caught up in months. Her brave endeavors are the reason I’ve evolved from a confused 17 year old into a confident and passionate adult. K: Who is your girl crush/idol? C: I absolutely love Robyn Lawley, an Australian “plus size” model. As well as being breathtakingly beautiful and a dedicated health advocate, she is very intelligent and politically educated. You can see pictures of gorgeous Robyn in an article for issue one! I hope you enjoyed this interview-I DEFINITELY did. Ciara is such a talented young woman, and I was head over heels in joy when she agreed to do the interview for my blog. It was such a pleasure to talk to her and learn more about Kimi Magazine and about her life and philosophy. So here’s a massive THANK YOU! to Ciara for sharing her insights and thoughts and providing us with such thoughtful answers. If you liked this post, don’t forget to like, comment, and follow! To like or comment on this post, just click the title of this post, then scroll down, and you’ll see the Like button and Comment box. Thank you : ) You’re wonderful for coming here and showing support too! Such a great interview Konni!! writers? I’m planning too start my own website soon but I’m a little lost oon everything.